Activists convened at a Pasadena courthouse on Monday to support 16 of their cohorts being arraigned, after they were arrested protesting a SeaWorld-themed float at the Rose Bowl on New Years' Day. Outside the courthouse 12-year-old Rose McCoy stood with other representatives of PETA, holding signs denouncing the marine park. She was arrested alongside the other protestors at the Rose Parade, but because she is a minor, her case is being handled separately and she was not arraigned today. McCoy, who was also seen protesting the same SeaWorld float in the Macy's Day Parade in New York City, recalled her experience for The Dodo. I know that when I'm an adult, SeaWorld as it is now will no longer exist. I envision a company that rehabilitates and releases injured and sick orcas, dolphins, and other marine mammals somewhere safe -- somewhere that lets visitors watch remotely, without the animals knowing, and then enjoy rides or music or whatever the park has to offer that no longer hurts animals. That's the future. I look forward to that, and I can't wait to look back on this time and realize that I was part of a movement that changed things for animals for the better. The courthouse protesters have uploaded images to social media today, calling on spectators to boycott the park. "SeaWorld is a monument to animal suffering, and cruelty to animals isn't something to celebrate at a parade," says PETA Senior Vice President Lisa Lange and one of the protesters who was arrested. "Spending a few hours in jail is no fun, but it's nothing compared to serving a life sentence in SeaWorld's orca prisons." UPDATE: A spokesperson for PETA has announced that the charges of "interference with a special event" filed against the 16 activists were dropped at the courthouse today. "It appears that the city of Pasadena has dropped all charges against those of us who protested the Rose Parade's endorsement of cruelty to animals," says PETA Senior Vice President Lisa Lange. 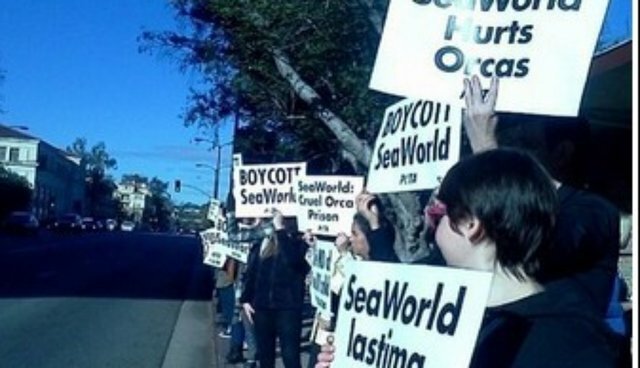 "PETA's protesters have received a phenomenal response from people across the country who join us in refusing to support SeaWorld's orca prisons, and we'll continue to protest this cruel theme park at every opportunity." While the protestors seemed hopeful, City Attorney Michele Beal Bagneris said her office planned to send notifications to the arrestees to appear in court again for arraignment in "three or four or five weeks." The office has one year to file a misdemeanor or infraction charge against the protestors, says the Pasadena Star-News.